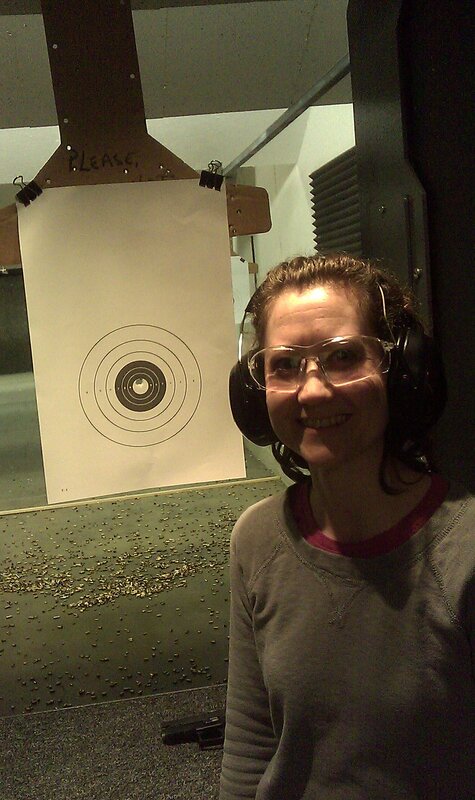 A couple of weeks ago we went to the shooting range with a some friends. The husband is a veteran who likes guns, and the wife fully supports his hobby and even has a pistol of her own. They’re a ton of fun to be around and we laugh a lot when we get together. Not too long ago they introduced us to an awesome little Greek restaurant in Magnolia called Nikos Gyros and the Seattle Pie Company just a block away. Perfect for an inexpensive dinner and dessert. During the course of that evening, it was determined that the next time they went to the shooting range they would invite us along. Which is how we found ourselves at the range on the 29th of January. Curly hadn’t handled a gun in well over 15 years, so she was a little rusty. 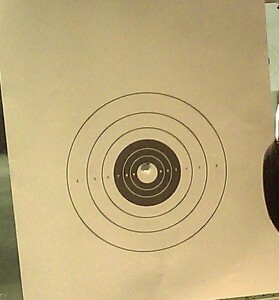 Here is a picture of her first shot. It should be pointed out the the 9 mm pistol she was using has a laser sight. But seriously. First shot. We also got to shoot our friend’s JP rifle. Large. Very nice. Fun to shoot. The other men at the range were drooling over it. We don’t have any photo evidence of Bee’s shooting skills (that’s not unusual, is it? ), but he’s a good shot and doesn’t use a laser. Looks like you had fun! 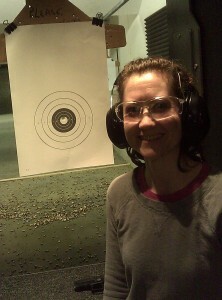 Laser sights are a far cry from shooting cans in the gully with dad. ← Villains of Seattle, Beware.